Good news for affidavit file holder’s that the DHA Multan Management has extended the date of conversion of affidavit files into the allocation. Now, 30 November 2018 is the last date of conversion affidavit files into the allocation. Thereafter no further extension in the last date will be granted. 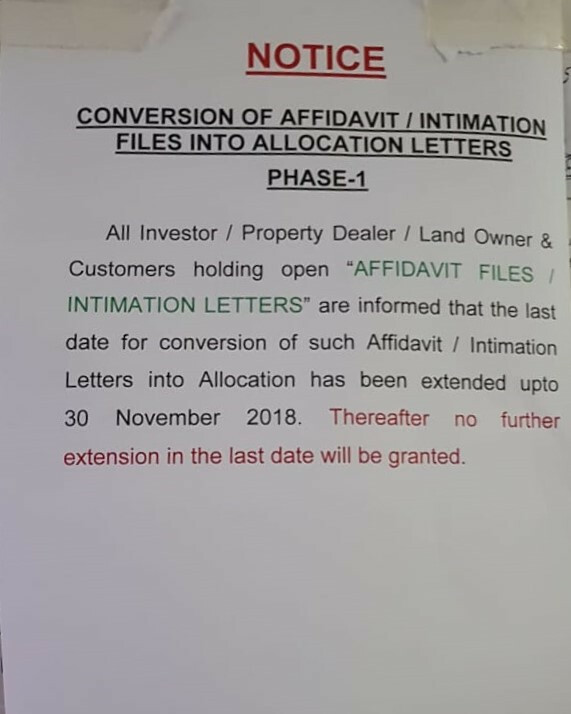 In our previous post, LRE was posted an official News From DHA Multan NOTICE CONVERSION OF AFFIDAVIT / INTIMATION FILES INTO ALLOCATION LETTERS PHASE-I All Investor / Property Dealer / Land Owner & Customers holding open “AFFIDAVIT FILES / INTIMATION LETTERS” are informed that the last date for conversion of such Affidavit / Intimation Letters into Allocation is 31 October 2018. Now they have extend the date for intimation letter.